← Is that movie director Tim Burton in front of my Gastown store? 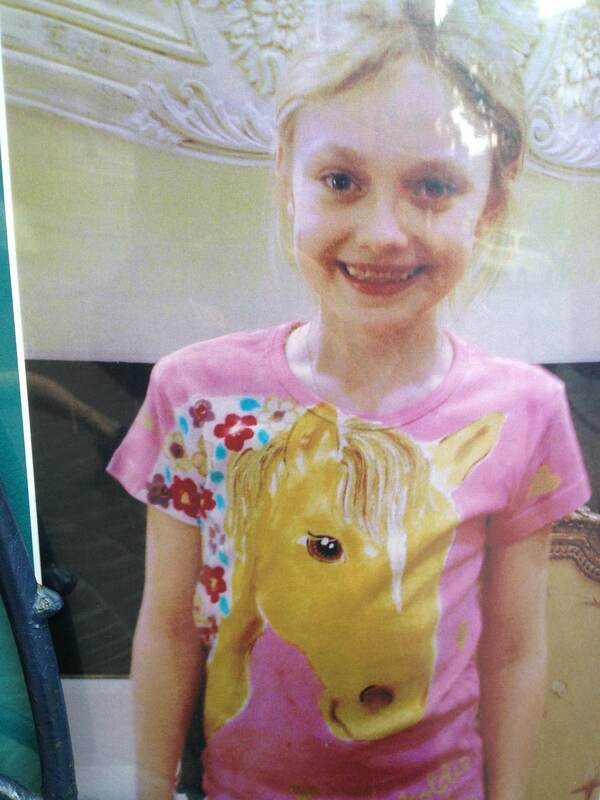 I painted her horse on a T-shirt. It was named Goldie after Goldie Hawn, the wife of actor Kurt Russell. The horse was given to her by Russell after they worked together on the movie Dreamer, which is based on a true story about bringing a race horse with a broken leg back to form and winning races. 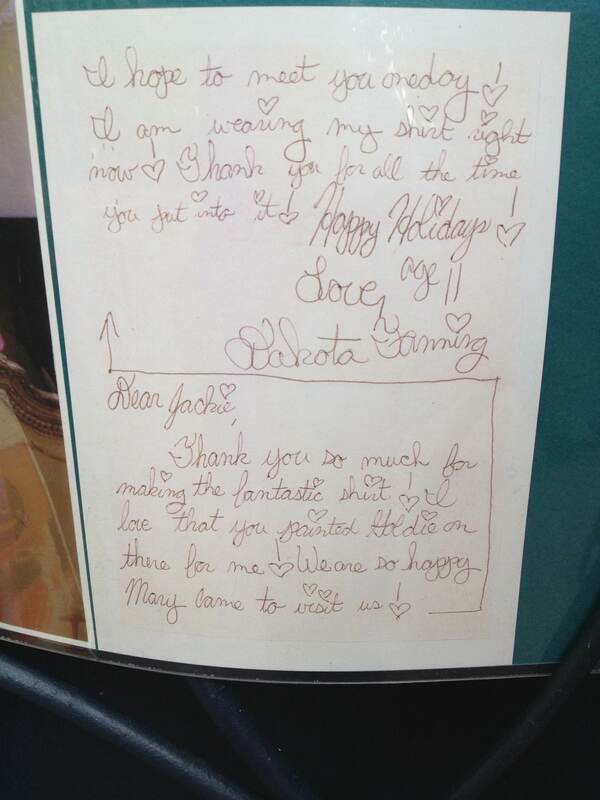 Dakota was such a sweetheart then. Of course, after I painted a T-shirt for Dakota, her sister Elle, also a fine actress, wanted a shirt with Goldie painted on it too, so I painted one for Elle. The sisters rode the horse all the time when they were that age. Angel specializes in custom hand-painted shirts. I paint both the front and back of shirts. Call (604) 681-0947 or email me at jackie@angelpaint.com. 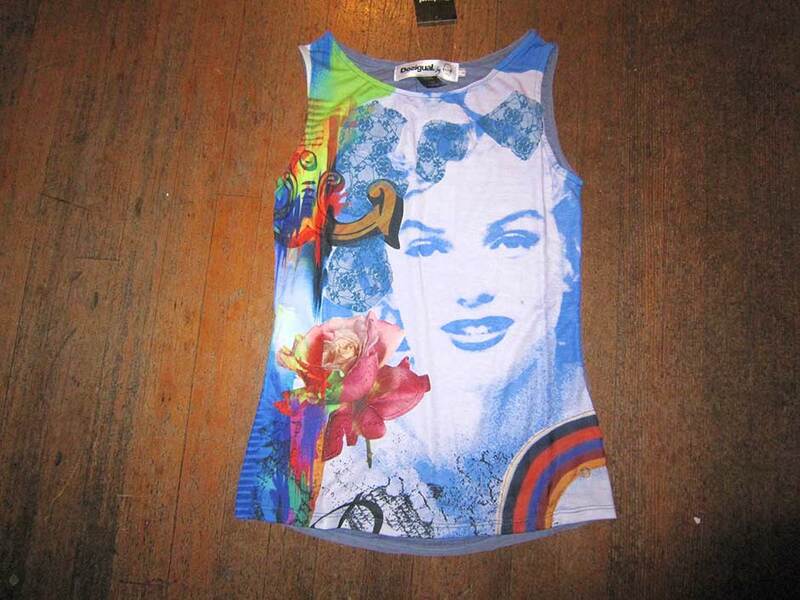 Angel also has one of the largest selections of Desigual clothing in the city for men, women and kids. At the moment, we’re offering a free pair of Desigual mini speakers, which are for an iPhone or iPod, with a purchase of $200 worth of Desigual clothing. This offer is available at Angel Vancouver for a limited time because we have a limited number of mini speakers. We also have Desigual computer tablet covers at our store, as well as a Desigual laptop shoulder bag that can be worn as a backpack (see photo below), Desigual headphones and Desigual market-size shopping bags. Click here to have a look at some of Desigual’s spring/summer 2013 collection we have in stock. This entry was posted in Desigual and tagged Angel Handpainted clothing, Angel Handpainted Fashions, Desigual, Desigual Canada, Desigual Vancouver Canada, Dreamer video by Jenn Grant, Gastown, Handpainted clothing, La Vida es Chula (Life is Cool! ), Vancouver Desigual. Bookmark the permalink.